White Christmas Forecast For Some From Wyoming Through Maine : The Two-Way Snow is predicted to form over the Great Plains and move across the Midwest and into the Northeast by Christmas. Parts of New England could see the highest accumulations. People from the Great Plains through New England have a good chance of getting a white Christmas this year. That white lie about snow on Christmas, "just like the ones I used to know," is probably going to remain a nostalgic lyric for most of the country. But for millions of people along the projected path of a system forming Saturday in the Great Plains that is forecast to become a nor'easter in New England by Monday, a white Christmas is looking more like a reality. "We are going to have a decent swath of snow," meteorologist Marc Chenard with the National Weather Service tells NPR. Beginning Saturday, a couple of inches are expected in Wyoming, Colorado and Nebraska. As the system shifts eastward by Christmas Eve, it is forecast to blanket parts of the Midwest, including Illinois, Michigan and Indiana. Chicago should get 2 to 3 inches; Kansas City, Mo., 1 to 2 inches, Chenard says. The system is then expected to bring the highest accumulations to central and northern New England when it re-forms off the coast as a nor'easter on Christmas Day, bringing "probably quite a bit of snow — 6-plus inches," Chenard says. Portland, Maine, and Burlington, Vt., are both forecast to get a half-foot each. But snow in southern New England is less certain, with Boston predicted to get perhaps 1 to 3 inches, although it is possible the storm could shift away from the city. New York City "is on the edge," Chenard says. 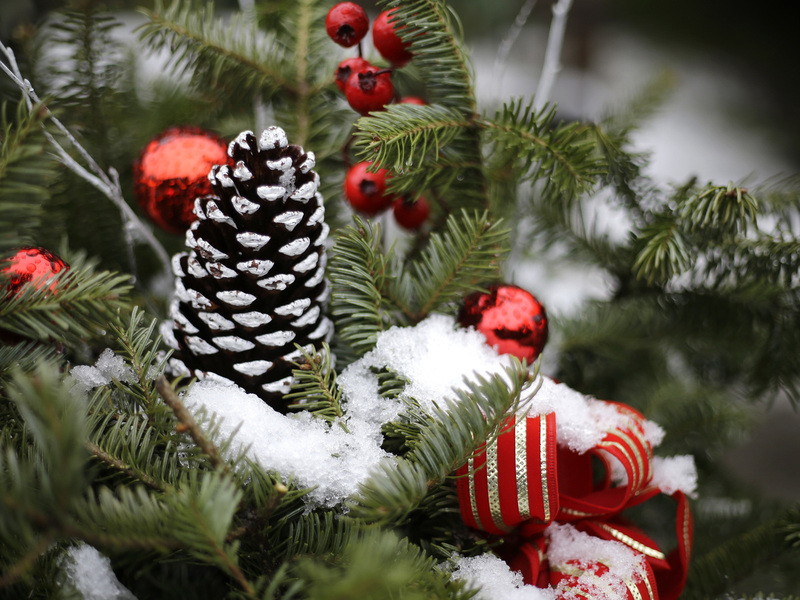 It will likely be warm enough for mainly rain, but "there could be a little bit of snow that tries to mix in and maybe gives some light accumulations on Christmas." Despite Americans' unending hope of waking up to snow on Dec. 25 — blame Bing Crosby's 1942 classic — bare grounds are bound to be the norm for most of the country on most Christmas mornings. Only somewhere around one-quarter of the contiguous United States is usually snow-covered on Christmas, reports USA Today, citing AccuWeather. The National Oceanic and Atmospheric Administration has put together a map of the places that have the best odds of experiencing a white Christmas. "The places where one is most likely to experience both snow on the ground and falling snow are in the Sierras and Cascades, on the leeward side of the Great Lakes, and in northern New England," NOAA says. "At high elevations of the Rocky Mountains and at most locations between the northern Rockies and New England, the probability of measurable snow depth is greater than 50%, while the probability of snowfall is generally less than 25%." Not surprisingly, "snow is at best extremely rare" in Southern California, the lower elevations of the Southwest and Florida. But it never hurts to dream.